Sudoku Mahabharat 2015 Final is over now. It was great competition with great set of puzzles. It was more fun to meet most of the puzzle friends after a long time. Thanks to organizers of this championship Deb, Rohan and Prasanna for organizing this championship perfectly. Also thanks to Sumit Bothra for all the goodies which each of participants got during this championship. Congratulations to Amit Sowani for winning this championships. Also Congratulations to Rakesh and Gaurav who are 1st and 2nd runners up respectively in this championship. I have participated in many World Sudoku/Puzzle Championships, however this is the first time I am writing a detailed review of this championship. Let me start with myself reaching the venue. Amit and myself were the first participants to reach the venue. We reached around 8:45am and did our registration. After doing the registration, we got our Goodies file. Thanks to Sumit for these goodies. After registration we have enough time for Q & A session to start. Amit brought many board games along with him. So we decided to play one of these games. The game we played was Hanabi Card Game. Unlike other competitive game, this game was cooperative card game. We played around 4-5 rounds of this game and then Q & A session started. There was not many Question and Answers as most of the Sudoku types already appeared in 7 online round of Sudoku Mahabharat. Most of the questions were on the round 4 regarding shapes/size of Sudoku appearing in this championship. Answers to this was that shapes/sizes of these puzzles could change, however sames rules will apply on the Sudoku puzzles. This round contained 10 Classic Sudoku puzzles. I could complete 8 Classic Sudoku puzzles in this round leaving two 15 pointers Classic Sudoku puzzles. Akash Doulani did remarkably well in this round by completing all 10 puzzles with around 10 minutes of bonus. I think he was the only one who completed this round. For me once the results of this round were anounced, it was little disappointing for me as I had made minor mistake in one of the puzzle to loose around 25 points. This round contained 8 Sudoku variations. Most of the puzzles were easy in this round especially the most feared Toroidal Sudoku which was high pointer. However later we got know that 8 more hints were added this puzzle to make it easier. I spent lot of time solving Odd Even Sudoku. I could complete this round with 12 minutes of bonus. There were many participants who completed this round with Gaurav K Jain submitting this round with 20 minutes of bonus and scoring best in this round. Again in this round I made minor mistake in Arrow Sudoku to loose some of bonus points as well as Arrow Sudoku points. Round 3 contained 18 6x6 Sudoku puzzles with 3 puzzles linked to each other in the form of Relay i.e. one has to first solve top puzzle which was solvable independently. I really messed up in the starting of this round by solving the first Classic Sudoku wrong. After transferring digits to second Grid, the second grid also got solved. However when I transferred digits to the third grid, I could not solve third grid and then realizing that I made mistake in first Sudoku. I erased everything to solve it again. Unfortunately in second attempt I repeated the same mistake again. I could solve this puzzle correctly in third try but in this process lost quite a lot precious time and at the end I could not solve last four puzzles. Amit Sowani solved all the puzzles this round and earned 4 minutes bonus to take lead on others. After the completion of Round 3 there was Lunch break and Lunch was arranged by organizers in the same hotel. Lunch was very delicious. In the Lunch break we played another very interesting board game Love Letter brought by Amit Sowani. This round was having Standard Sudoku variations like Expanded Sudoku, Overlapping Sudoku, Compressed Sudoku and Linked Classics. My target in this round was to complete all the puzzles. I started with Expanded Sudoku and it was an easy solve. Then I started with Overlapping Sudoku. This Sudoku has the different Overlapped area as compared to puzzle given in the Instruction Booklet. I was proceeding well in this Sudoku but suddenly realized that I had made a mistake while solving this Sudoku. So I left this Sudoku to complete other remaining Sudoku. Later I came back to correct Overlapping Sudoku, but could not correct this in time. 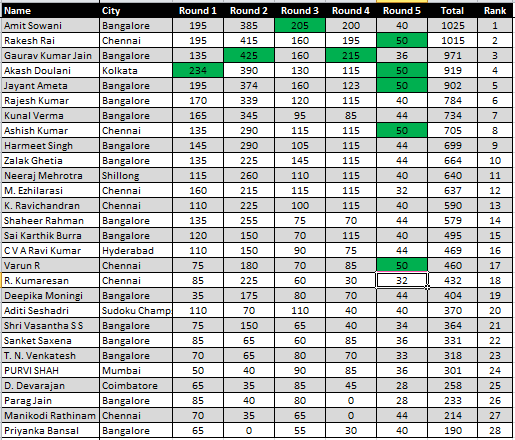 Gaurav again did quite well in this round to pull back a good score after a bad start in 1st round. This round was fun round. Rules of this round were explained just before this the start of this round. In this round we were shown some solved Sudoku puzzles. These puzzles were either correctly solved or there was some minor mistakes in these puzzles. We were shown the puzzles for 60 to 100 seconds and at the end we need to mark these puzzles as Correct or Wrong. Maximum score in this round was 50 including the bonus of 2 points. Most of the participants scored quite good in this around with 5 players scoring bonus in this round. In fact Sudoku Mahabharat Final consists of only 5 round. This 6th round was just a team fun round used as recreational activity before the results being announced. In this round we were told to make the team of 2 people. In fact name on our ID card was given some color and based to the combination of light and dark color combination we have to make team. My teammate in this round was Parag Jain (very promising Sudoku player). This round was Tiles Sudoku in which we have to put given tile in each cell of 6x6 Sudoku so that colors, digits, shapes and letters are not repeated in each row, column and 2x3 box. We were progressing good in this round. However before we could complete this round there were 3 team which competed this Sudoku correctly. This round even though was not part of Sudoku Mahabharat, however give a very good idea of Team rounds in World Sudoku Championships. After adding the scores of all the 5 rounds, Amit Sowani became the winner of 1st Sudoku Mahabharat followed closely by Rakesh Rai. 2nd Runner up of this championship is Gaurav K Jain who came back very strongly after not very good performance in 1st round. I stood 6th in this championship. Here is full result of this championship. Congratulations to all the winners of this Sudoku Mahabharat. In fact Congratulations to all the participants esp. 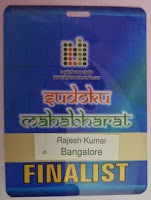 to those who traveled to Bangalore to participate in this championship. Neeraj Mahrotra and Akash Doulani traveled from Shilong and Kolkata respectively to participate in championship. Here are most of the participants and organizers of this championship. 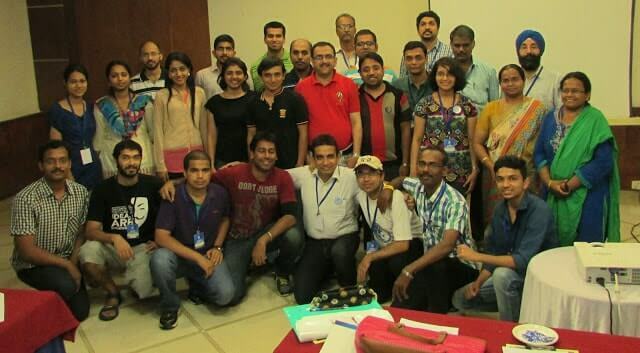 This photograph and results picture is taken from Sudoku Mahabharat discussion page @ LMI forum . Back row L to R - Jayant Ameta, Sai Karthik Burra, Prasanna, T.N. Venkatesh, K. Ravichandran, Akash Doulani, Deb Mohanty, Amit Sowani, D. Devarajan, Harmeet Singh. Middle row L to R - M. Ezhilarasi, Deepika Moningi, Purvi Shah, Zalak Ghetia, Ashish Kumar, Neeraj Mehrotra, Gaurav Kumar Jain, Aditi Seshadri, Shri Vasantha Senaa S, Manikodi Rathinam. Front row L to R - Varun R., Rohan Rao, Shaheer Rehman, Kunal Verma, Rakesh Rai, Rajesh Kumar, R. Kumaresan, Sanket Saxena. There are many who missed being part of this great event even after qualifying for the finals. These people not only missed the great even but also increased the expanses of organizing this event significantly. After the award distribution there was open discussion on the future events related to Sudoku and Puzzles. May be in the future events like this participants will be charged nominally. Once again thanks to organizers Deb, Rohan, Prasanna and Sumit for this great event. 1. World Sudoku Championship 2015: After reading about Indian Sudoku Championship and Sudoku Mahabharat 2015, its time now to read about Rakesh Rai's experience at World Sudoku Championship 2015 which was held in Sofia, Bulgaria. 2. Indian Puzzle Championship 2017 by Rajesh Kumar: This is experience of Rajesh Kumar during Indian Puzzle Championship in year 2017. 3. World Sudoku Championship 2012 Quarterfinal short video: Do checkout short video taken during 2012 World Sudoku Championship Quarterfinals. 4. The Science And Fun Learning Camp 2016: Do read about Science and Fun Learning Camp 2016 where kids are learning to solve Sudoku puzzles along with other science and fun learning projects. I think Saheer was the first player to reach the venue at around 8:15 ! Yes, you are right Deb. We saw Saheer there when we reached the venue. I alwyas reach any place early as just in time schedule may be risky if you get stuck in a jam anywhere.